3000 miles north & back: May Day bike ride. With blue and sunny skies this past Sunday, Matt and I once again hopped on our saddles for a ride around Minneapolis. We decided to navigate parts of the Grand Rounds Scenic Byway system, which is a series of park areas linked by bike trials that takes a roughly circular path through the city. Instead of leaving from Chaska, we began our ride from The Depot in Hopkins, so we could spend more time riding around Minneapolis. According to the Minneapolis Parks and Recreation website, the Grand Rounds National Scenic Byway is part of the Federal Highway Administration's National Scenic Byways Program, which recognizes and supports outstanding roads. The Grand Rounds is one of the country's longest continuous systems of public urban parkways and has been the preeminent urban parkway system for more than a century. ...and includes Saint Anthony falls and the historic milling districts. Saint Anthony Falls was the only natural major waterfall on the Upper Mississippi River and is the 17th largest waterfall on Earth, 5th in the United States. The Byway follows West River Parkway on the west side of the river and leads to the Stone Arch Bridge, a railroad bridge turned pedestrian and bicycle bridge and the only arched bridge made of stone on the entire length of the Mississippi River. 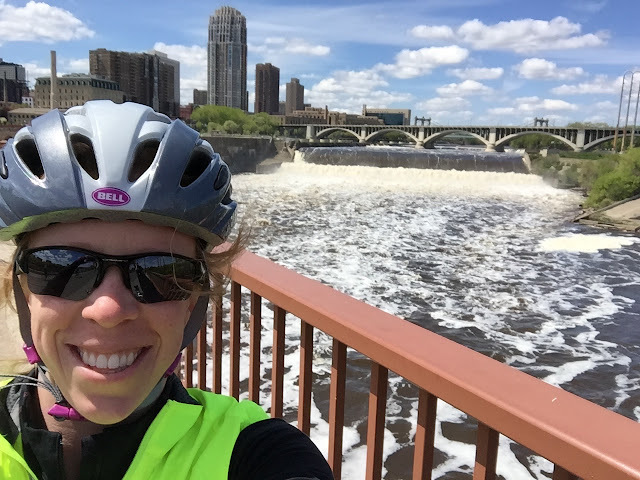 Mississippi River (9.2 miles): Extending from downtown to Minnehaha Park, some of this segment was under construction, so we took a detour through the west bank of the University of Minnesota. This detour brought back small reminiscences of our ride a few weeks ago…. Minnehaha (12.6 miles): This segment includes Minnehaha Park, where we spent some time walking around and viewing the Minnehaha Falls. Matt and I were impressed how busy the park was with families picnicking, riding bikes and walking around. This section becomes Minnehaha Parkway after crossing Hiawatha Avenue and follows Minnehaha Creek to Lake Harriet. We decided to stop for some homemade ice cream at the Grand Ole Creamery on Cedar Avenue. There were lines out the door, but the wait actually was not long. There were over 20 flavors to choose from, but Matt settled on Coffee Break and I chose a combo of Coffee Break and Coconut Chip. Chain of Lakes (13.3 miles): This section includes routes around Lake Harriet, Lake Calhoun, Lake of the Isles, Cedar Lake, Brownie Lake and Lyndale Park. This lake parkland is collectively called the Minneapolis Chain of Lakes Regional Park. 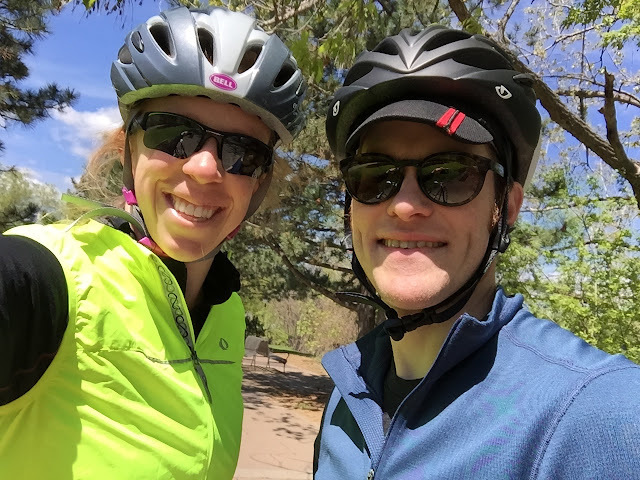 We made sure to loop completely around Lake Harriet, Lake Calhoun and Lake of the Isles before passing by Brownie Lake and connecting back on to the Midtown Greenway and the North Cedar Lake Trail to Hopkins. 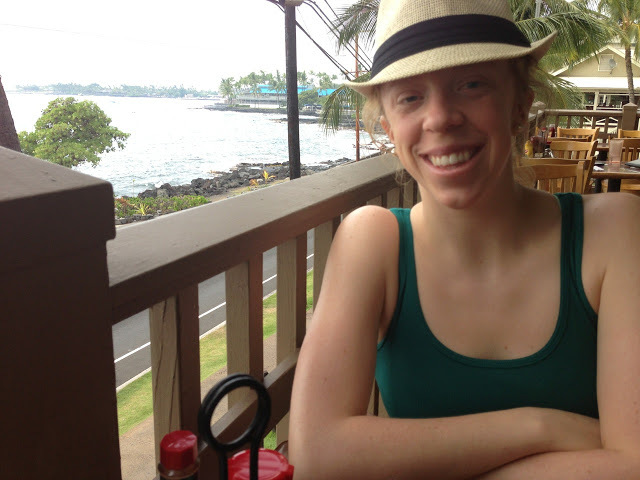 Upon arriving in Hopkins, we stopped for pizza at Pizza Luce. With a number of locations around the Metro, the pizza has been coined as "Minnesota's best pizza." Matt and I shared a meatball appetizer and a Spanish Chicken pizza on thin crust. We both agreed the pizza was delicious...Matt even said it might be the best pizza he has ever eaten! Matt rode his single speed bike, and I rode my 35 pound Raleigh hybrid. The total time from when we left Hopkins to when we were seated at Pizza Luce was 7 hours and 30 minutes. 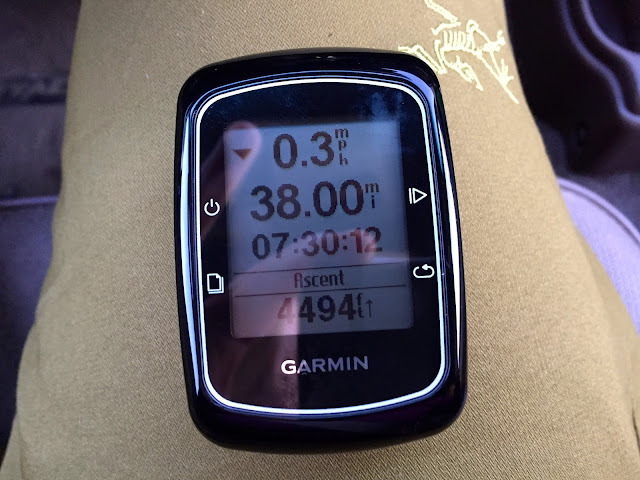 We put just under 40 miles on the bikes and ascended roughly 4500 feet. Not a bad day!